Ombre was a popular dye technique for fabrics through the ages but it's now a trendy coloring you can find on anything from nails, to cakes, to dresser drawers, to hair dye and so much more. If you have a Pinterest account, you know how popular this dip-dyed color effect is in the craft and fashion world! This is a bracelet you can whip up in less than an hour. Loving the feather, right? It's new from Vintaj and makes the perfect cuff for a bracelet. 1. Bend the feather with your hands to form a curved cuff, slow and gentle will give you the best results. 2. Paint the feather. Start with quartz, then opalite and cobalt. Let the paint dry for a few moments and then do a light coat of aged bronze. Apply sealant and wax. 3. Use round pliers to form a loop with the end of the feather. 4. Create links with the eyepins and disk beads. 5. Attach the links together with chain nose pliers, opening and closing the links. 6. Attach the links to the feather with a jump ring. 7. 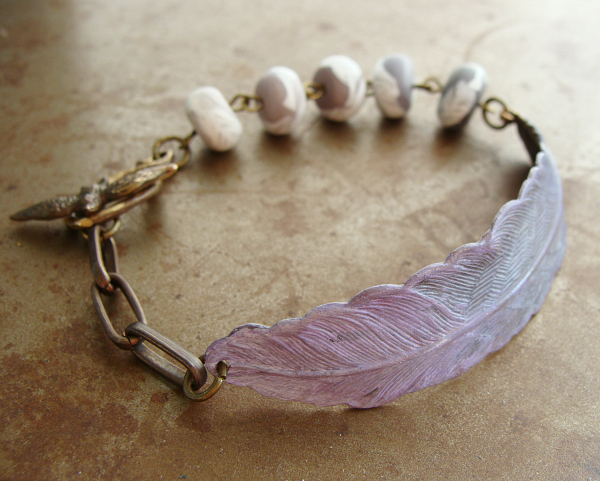 Use a jump ring to attach 3 links of the chain to the other side of the feather. 8. Use jump rings to attach the bird toggle clasp to the chain and links. From Vintaj: Circle Frame. I hammered and painted it. Stained Glass Window Pendant: I connected it with waxed linen to the frame. Elongated Half Oval Chain: I took a few of the links and used them to connect to the chain to the pendant. 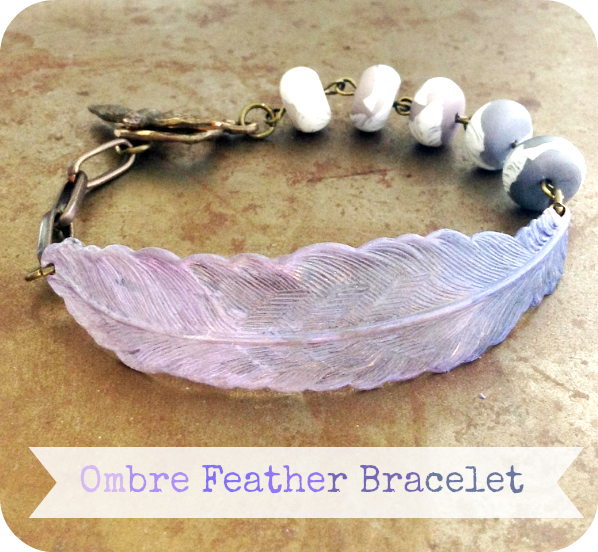 Humblebeads Ombre Feather Pendant. Delicate flat oval chain and earwires from Vintaj. Geometric Ombre Disk Earrings from Humblebeads. A special thanks to Vintaj for sending samples from their new collection. The links above showcase the ones I used.